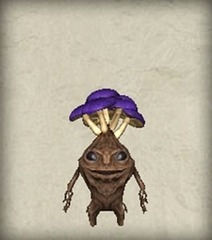 A Mandragora with a growing cluster of infected mushrooms. The surface of the purple mushrooms are slimy, so one should not carelessly step on it as the slime sticks to the floor and does not easily come off. This makes it very difficult to grow the Mandragora at home.